Home > Healthcare Risk Management > Sepsis Misdiagnosis and Mismanagement – complex or simple? It all depends on what questions you ask and are you asking the right healthcare professional when addressing sepsis and/or Septic shock in any Medical Malpractice case from loss of a limb due to vasopressors to death from a mismanaged wound. One must first look at how the patient presented to the hospital and what time was the first antibiotic hung. How can this be identified without enduring the cost and time it takes to obtain extensive medical records? Simple, it is not what you ask but how you ask the client and or their family will determine if it is worth further investigation even before discussing the case with your medical expert. Who is the best person to evaluate that first step when investigating the causation and damages from sepsis but the person who is responsible for identifying and initiating medically prescribed treatment within a 3-hour timeframe? Would that be the Triage Nurse, Emergency room Nurse or the In-house nurse? Here is the brief background on how Sepsis early identification and current medical and nursing guidelines have evolved. Since 2002 the Surviving Sepsis Campaign began to address the risk and financial burden of Sepsis. By 2004 Sepsis was emerging as the research disease forefront not just to decrease mortality but to reduce the extensive cost associated with treating Sepsis. In 2011 Gordon and Betty Moore Foundation fund development of educational programming, research, and campaign outreach were started to educate health professionals on early identification and treatment of sepsis. 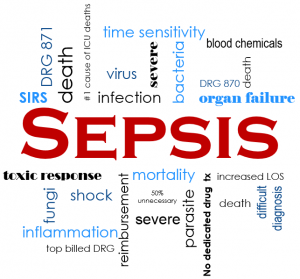 In 2013 the Regulatory bodies in the United States adopt the Surviving Sepsis Campaign Bundles as mandated measures. In 2016 the European Society of Intensive Care Medicine and the Society of Critical Care Medicine published the Surviving Sepsis Campaigns: “International Guidelines for Management of Sepsis and Septic Shock to implement and improve sepsis outcome the Institute for Healthcare Improvement (IHI) incorporated its “bundle concept” into the diagnosis and treatment of patients with severe sepsis and septic shock”. How this simplifies a Medical Malpractice case where sepsis was misdiagnosed or there was a delay in diagnosis which ultimately caused that patient to lose a limb or death comes down to a simple 3-hour window from the time the patient enters the emergency department or another venue to the start of medical management. Barbara J. Brasher RN, CLNC is a legal nurse consultant at Med League. Barbara has extenstive background in emergency, trauma, cardiac, and neuro nursing care. Med League provides highly-qualified Emergency Room Physician and nursing expert as well as other medical experts witness who can review your sepsis case. Contact Us for your next case.